Sankashti Chathurthi Vrat is considered the ultimate vratha for devotees of Lord Ganesha. Observed on the 4th day of the Krishna Paksha (4th day after each Poornima), this vratha is believed to remove all obstacles and absolve your sins. It is also known as Sankat Hara Chathurthi or Sankasthahara Chathurthi. There are several stories associated with the greatness of Sankashti Chathurthi. One story revolves around how Indra was once grounded because a sinner set sight on him while he was flying across King Shurasena’s kingdom. His vahana could start flying again only after he gained the merits of a person who had observed the Sankashti Chathurthi Vrat. In another story, the moon loses his lustre when he becomes egoistic about his good looks and teases Ganesha about his trunk and pot-belly. Thereafter, he regains his lustre by worshipping Lord Ganesha and begging his pardon. There is one more fable about a sinner who went to heaven because she was ill and could not take food on Sankashti Chathurthi day. On feeling better, she had a morsel of food after moonrise. Even though she did this without her knowledge, she still gained the merits of this vratha and was taken to heaven upon her death! Indeed, there are innumerable stories about the greatness of this vratha. So, how should it be observed? On the morning of Sankashti Chathurthi, devotees rise early, take bath and declare their intention to observe this fast. Throughout the day, they observe a full or partial fast. In the evening, at the time of moonrise, they visit a temple and participate in the puja, or they do the puja at home. The traditional puja includes worshipping Lord Ganesh by chanting his names, offering flowers as well as traditional prasad like Modak, followed by the aarti. Some people also have the practice of reading different fables about the greatness of this vrata, a different episode for each month of the year. Sankashti Chathurthi, when it falls on a Tuesday is considered especially auspicious. It is known as Angaraki Chathurthi, as Mars or Angaraka is the presiding deity of Tuesdays. Those who wish to start observing the Sankashti Chathurthi vrat for the first time prefer to start from an Angaraki Chathurthi. In South Indian, people usually observe a complete fast. Some do not even consume water, while others have fruits, water and milk alone. After moonrise, they complete the puja and end their fast. Some communities end the fast by consuming a kheer made of Paal Payasam and Rice Kheer, while others have a proper meal of faraali foods. In North India, some people observe a total fast till moonrise while others have permitted faraali foods during the day too. Office-goers often cannot observe a complete fast and need some faraali foods to top up their energy reserves. This article gives you some such classic faraali recipes like Sabudana Khichdi, Sabudana Vada Stuffed with Coconut Chutney, Upvaas Thalipeeth, Rajgira Puri and Buckwheat Khichdi that you can have during the day or after ending the fast in the evening, depending on the practices you follow. We have also included some light, innovative recipes like Faraali Misal, Potato Khichdi and Faraali Dosa that you can have as a wholesome snack. Piyush is a wise glassful for a fasting day, especially during the summer, as it energises and keeps you cool. Yellow Banana Wafers is a faraal-friendly jar snack that can come to your aid when you feel too hungry to go on. If your fasting rules allow curds, you can have some satiating dishes like Dahiwale Aloo Ki Subzi or Aloo and Kand Rasawala Shaak. We have also included classic Prasad recipes like Modak and Shakarkand Ka Halwa! A fast puts your self-control to test and makes you feel good if you succeed. It also proves your devotion to God and strengthens your faith. Armed with these apt recipes, you will be able to dedicate yourself more confidently to the fast and complete it successfully. 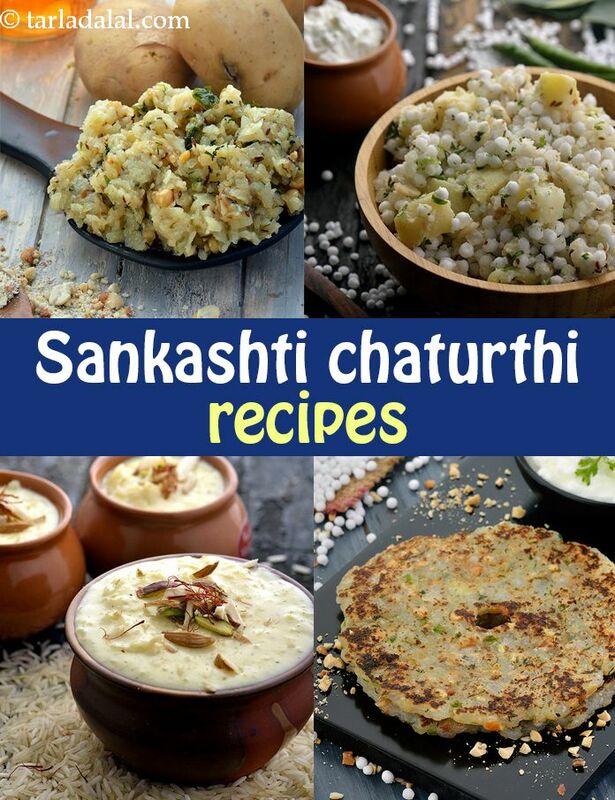 Today is the day of Sankashti Chathurthi. I Cleaned our Devahraa (place where home God idol''s are kept & worshipped everyday). Decorated & Offered the flowers & garlands to lord Ganesha with true & pure heart. Here at TarlaDalal.com very nice information & importance about Sankashti Chathurthi Vrat and the food recipes we can have on account of this Vrat. I liked Sabudhan Khichdi, hence my wife most probably gives me Sabudhana Khichdi in tiffin. My Colleague also enjoyed eating this... Potato Khichdi, Faraali Misal, Faraali Pattice is the other dishes which i liked very much.